Happy Hump Day my friends! I promise the Olympic Trial recap and LA Marathon recap are coming soon. But today is the Giveaway Roundup. Last week, Erica and I had over 60 linked up giveaways! Keep checking back throughout the week to see what is added! Now for my giveaway of the week! 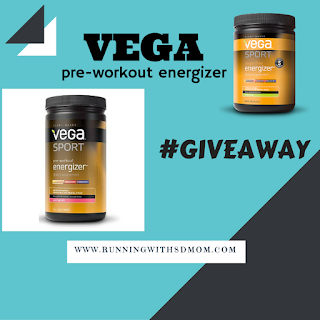 I am giving away my very first and very favorite "can't leave home without" Vega product - Pre-Workout Energizer. You can enter that one here. Hurry because it ends on 2/17. Don't fret if you don't win. I have another Vega giveaway coming REALLY soon!